Hi. Hope everyone's doing great. Im a newbee to this forum. And i badly need help. Sorry to ask your opinion and experience on this irrelevant topic. Im currently experiencing hair loss, specifically diffuse pattern alopecia. And in my desperate search to hair loss solutions, ive come across a hairloss forum that talks about MTF HRT that successfully reverse hair loss. Would like to know if someone here has experienced hair loss (might be mild or severe) and has regained the lost hairs with the said MTF HRT. Hope you could give me honest opinions. Because if this could be real for somebody here, hair would be a bonus to me if im to start with the MTF HRT, as transitioning has always been my longtime dream but was been afraid to start due to religious family pressure. 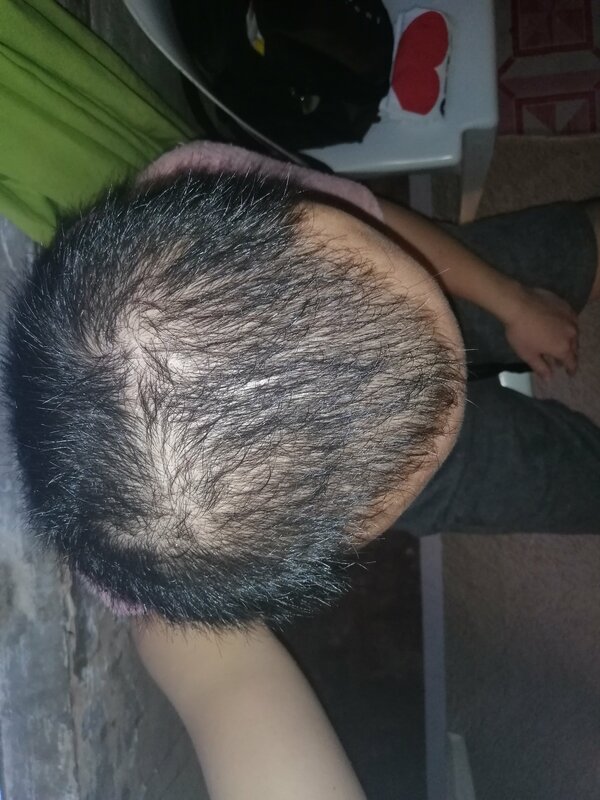 Please see images of my hair loss. On HRT your entire head to hair will be replaced over a 2 to 3 year period with softer and maybe finer hair. I had hair loss in the area you are showing, and a fair amount of it grew back as baby fine, and maybe a little sparse, but it did fill in and I am not having to wear a topper wig. An actual female hair style with your pattern would blend over the area where you are thinning out there. One of the drugs used to prevent male pattern thinning that is prescribed for Cis men, is one in the HRT medicine list for transition, so you would not necessarily have to "come out" to your family if you are taking it. Hello Kezz. Your question is not irrelevant. While I am not a medical professional, I believe you should be able to regain growth as Vicky suggests under the right conditions and medical care. You should speak to your doctor. I have gained a good bit of my hair back since starting hrt. I am still nowhere near where I want to be, but spiro stops the hairloss dead. Estrogen will help some come back. Finestaride helps with regrowth as well and it can be gotten cheaply. And the minoxidil helps a bit too. Plus the laser caps they have now are really great! Between all of that and the option for transplants as well you should be able to find some level of acceptance. And total cost for finestaride and minoxidil for me is under 100 dollars a year! That’s not bad for hair. 😁 and you’re nowhere near as bad as i was or even still am. I am noticing that my receding hairline is "de-receding" as well. I have only been on hrt for 18 months and am happy that I am getting hair back. I am only on estradiol and spironolactone and that seems to be working for me. Thank you so much for your advice VickySGV. For that medicine, are you referring to Finasteride? Or something else?